The aluminum plate to which the halyard cover door is attached measures 6″ wide x 5′ high & 1/4″ thick. Designed to be mounted with 4 fasteners using 3/8″ or 1/4″ diameter threads. The cover is semi-circle to fit into the lock box. Cast Aluminum with stainless steel hinge pins. 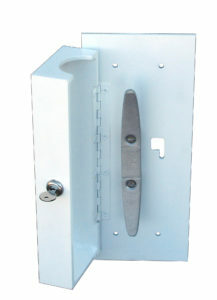 Design allows for easy installation utilizing the cleat holes to mount the cleat cover box. Two extra long 1/4″ – 20NC stainless steel mounting screws are included. The distance between bolt centers is 2-3/4″. Lock & 9″ aluminum cleat not included. Mounting the box 10′ to 12′ off the ground will offer more protection. Part #805830 fits 3″ & 3.5″ 805832 fits 4″ to 12″. 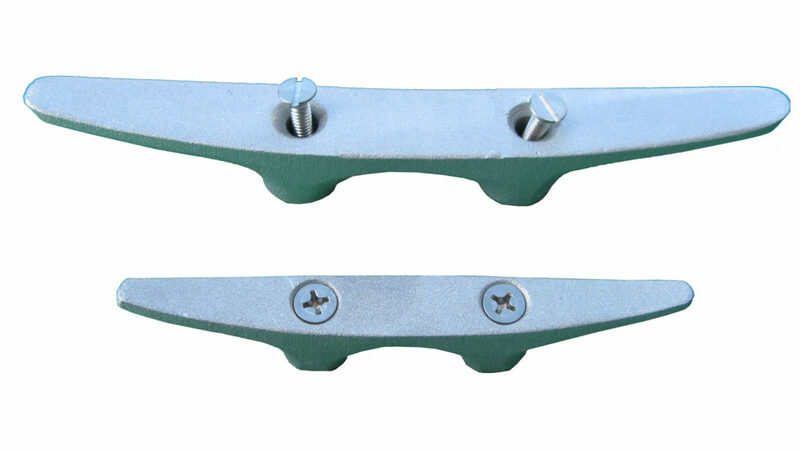 The flagpole halyard cover is made of aluminum channel and is designed to be used with the flagpole cleat box. The halyard cover has upper, middle & lower hinge assembly and is secured to the pole with 6 #10-24 NC stainless steel pan head screws (included). 10/24 NC tap is required for flagpole.